NorthStar Alarm runs in the Dirty Dash to help raise money for Youth Making a Difference (YMAD). YMAD is an organization that teaches teens how to make a difference in the world. It was awesome to participate in the Dirty Dash knowing that it was benefiting Youth Making a Difference. Thousands of eager people drove up Provo canyon to Midway last Saturday to run the Dirty Dash. This year the Dirty Dash raised funds for Youth Making a Difference, an organization that helps teens learn fundamental skills in developing countries such as India. The teens give service, do research, work in teams, and learn other responsibilities. The Dirty Dash allows runners to run either a 5k, or a 10k through muddy obstacles. The course is appropriate for all ages, and there is an emphasis on having fun. The race isn’t timed allowing participants to fully enjoy getting muddy. The Dirty Dash has many locations throughout the U.S.; there are eleven cities where the race is set up. Each Dirty Dash location sponsors a different charity, ranging from cancer research to the Special Olympics. A mud run through obstacles for a designated distance. Focused on fun rather than competition, the Dirty Dash is appropriate for all ages. 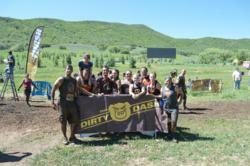 For more information, please visit http://www.thedirtydash.com.